NOTE: This Product In Not Yet Available For Canada Shipping. Prevent a cold in an all-natural way! Herbal Immune Boost strengthens the immune system with natural boosters to help ward off colds during times of stress and high risk of germ exposure. Beachbody’s Herbal Immune Boost is fantastic to take when traveling by plane or working in close proximity to those with colds, because it helps . . . 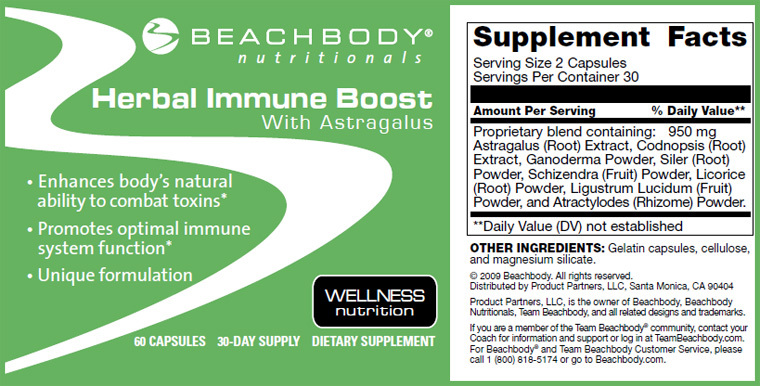 Experience the natural preventive effects of astragalus! And, as with any Beachbody supplement, you can be sure it’s been thoroughly tested and exceeds the most stringent standards for safety and potency. Staying healthy and preventing a cold is crucial to your fitness progress. Whether you’re doing P90X®, ChaLEAN Extreme®, or Hip Hop Abs®, it’s vital to maintain good health so you can give your best efforts on a consistent basis.